Ms. Michelin and Mr. Suarez discuss the global sustainability work of WEC and its mission to advance sustainability in partnership with WEC member companies, governments, multilateral and academic institutions, and other NGOs. Mr. Suarez shares how member companies such as Coca Cola-FEMSA, of which he is the Director of Business Development, participate in WEC’s forefront activities and projects, and the importance of having a membership comprised of global corporate sustainability leaders. Mr. Suarez also details the great value he encountered as former Chair of WEC’s Board, supporting WEC projects that are creating positive impact around the world, and the opportunity to strengthen his relationships with other corporate leaders in global sustainability. The article highlights WEC’s impactful corporate sustainability project work in Latin America, in particular WEC’s Private Sector Clean Production Partnerships in the priority industry sectors and specific supply chains in countries throughout the hemisphere; a network of innovate solutions in the region that support the sustainable growth of local Micro, Small & Medium Enterprises (MSMEs); and a collaboration with national Universities in the region to strengthen student sustainability education through both curriculum development and on-site training with participating MSMEs. Mr. Suarez discusses his observations on the general response of government and the private sector to the UN Sustainable Development Goals, noting WEC’s current study on Sustainability Management Frameworks in Mexico and Chile, funded by the German government and he highlights the importance of WEC’s diverse membership of global companies whose shared commitment to international sustainability is their common thread. Ganar-Ganar also profles the sustainability practices, of WEC member Fresnillo. 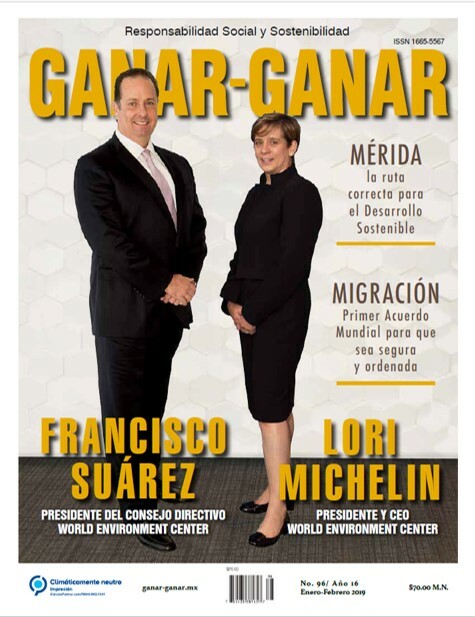 Entrevista con Lori Michelin, CEO y Presidente del World Environment Center (WEC), y Francisco Suárez, Presidente anterior del Consejo Directivo del WEC, sobre el fomento de soluciones con empresas para abordar el desarrollo sostenible.